Columbus Day is an American national holiday that commemorates the landing of Christopher Columbus in the new world back in 1492. What better way to celebrate and commemorate one of the world’s greatest explorers than with DIY map crafts. Old maps or new, home décor items or wearable accessories, projects crafted from maps are sure to awaken the inner explorer in all of us! 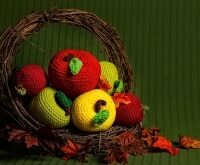 Fall and crafts belong together. 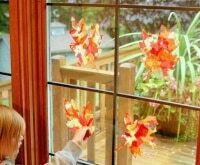 Get inspired with 19 fun apple crafts, 25 easy fall crafts for kids, and 25 DIY projects that bring nature inside! 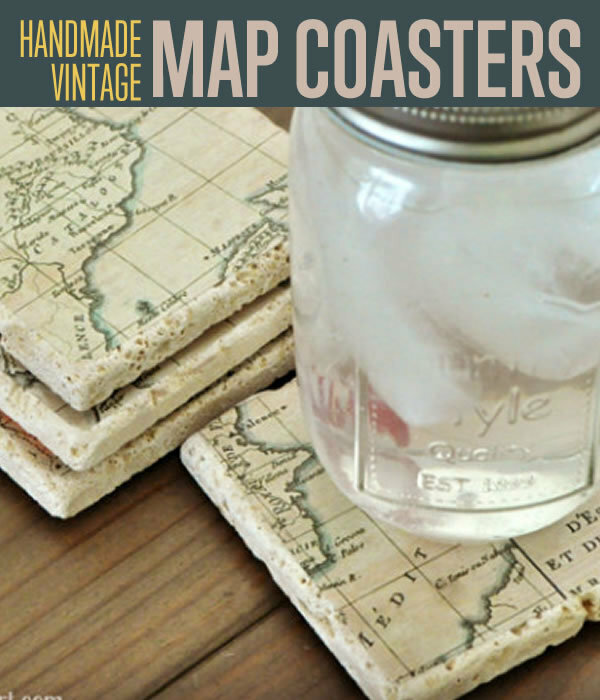 Give your table some rustic charm with these old-world map coasters. Simply adhere and seal old maps to square tiles. Make it personal by using maps of your hometown or favorite vacation spot. Dollar store trays become chic and handy memo boards thanks to the addition of spray paint and maps. Pick colorful maps for a vibrant display or choose neutral ones for a more toned down version. Need more whimsical wall art ideas? Check out these creative projects using bicycles! 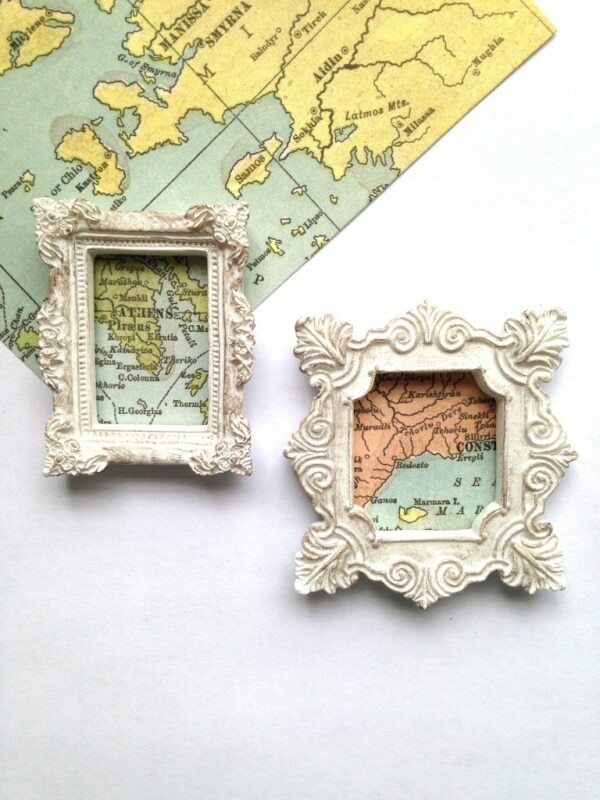 Conjure up happy memories and/or commemorate your favorite worldly spots with framed map magnets. Pick frames that match your décor and try to cut out your images from a single map to make a coordinating set. 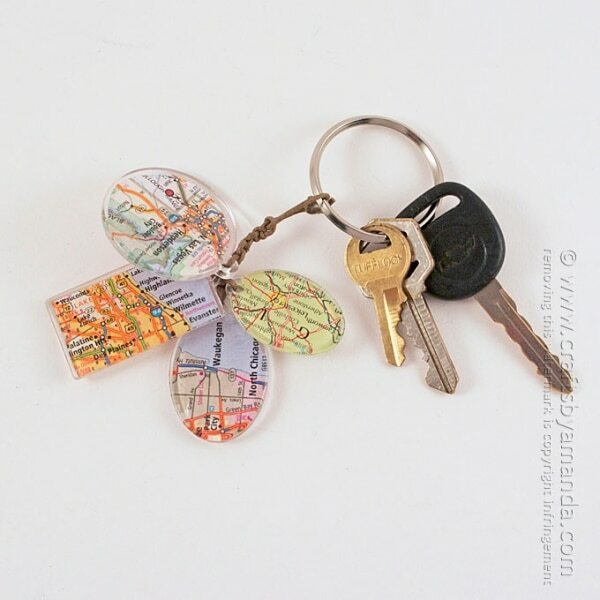 Commemorate your birthplace with this awesome key chain idea. 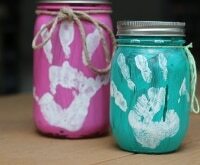 The use of pre-made acrylic shapes makes this a quick and easy project for any skill level. Keep track of all the places you’ve visited in this unique and clever way. 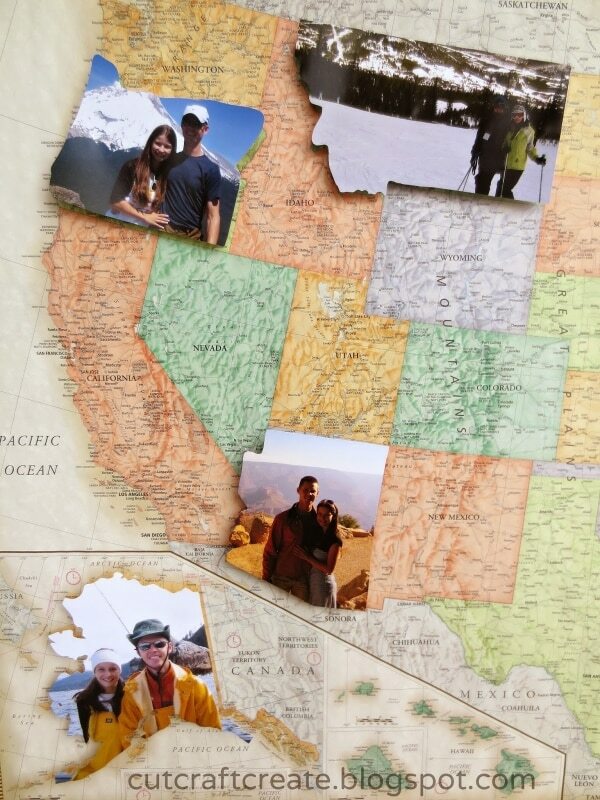 Instead of just marking locations on a map with a pin or flag, cut out your favorite picture from the trip in the shape of the state and lay it over the map. 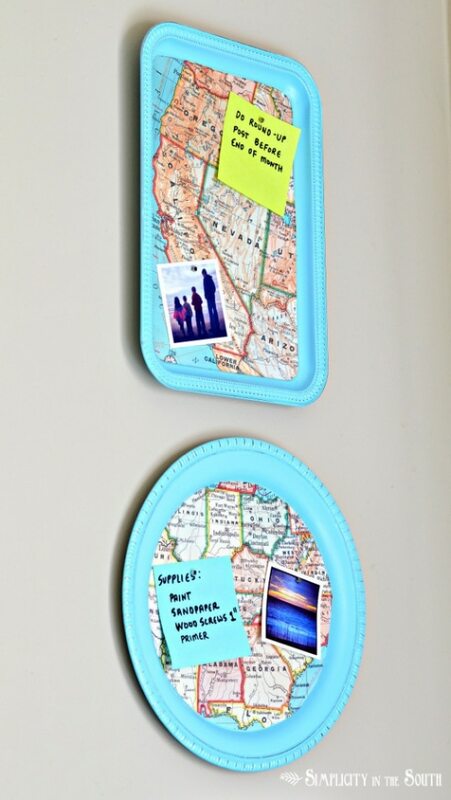 What a fun and visual way to keep track of your travels and memories! Old globes abound at thrift and antique stores. Find one with a patina that works with your décor and then add your favorite phrase in vinyl or paint to create a sentimental and inspiring home accessory. Bright maps are great for adhering to almost any surface. Here, plain and simple birdhouses are given happy makeovers with paint and maps featuring topography in matching colors. Create an ever-present reminder to always explore the world around you with a simple map monogram. Attach a bright map to a plain letter from the craft store for this ultra chic yet super simple bookshelf accessory. 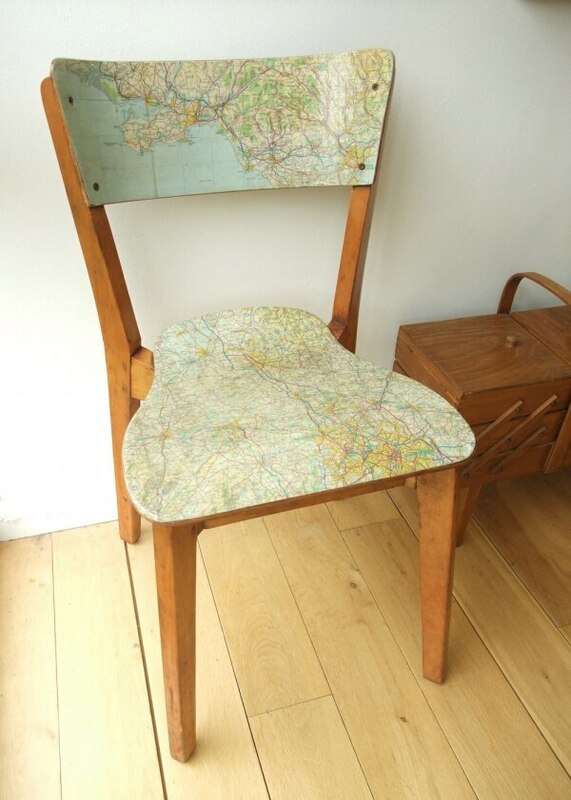 Thanks to their large size and interesting patterns, maps are great for up-cycling furniture. Choose maps that have personal meaning or tell an interesting story to really create a conversation piece. 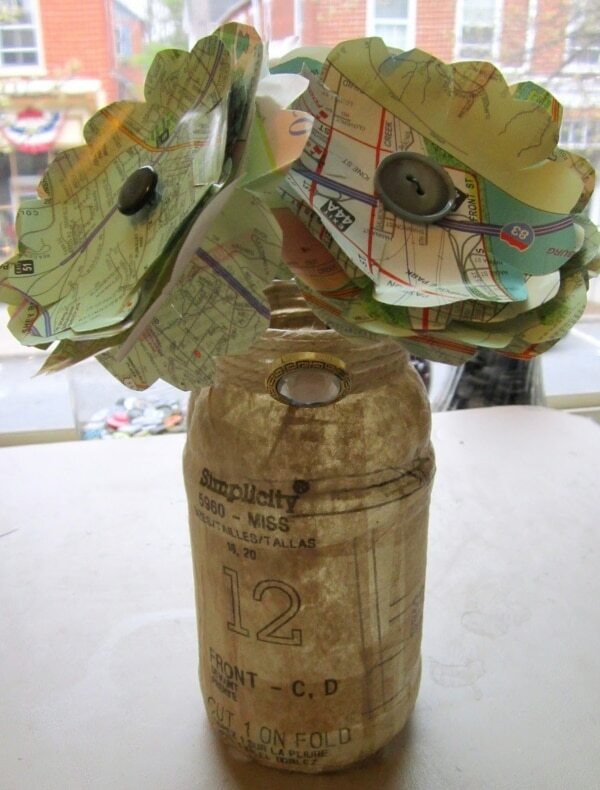 Here’s a perfect craft for any old maps you may find in the basement or thrift store. Cut them into flower shapes, stack, and secure to make a unique table centerpiece. 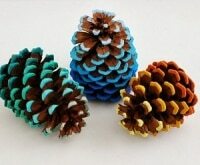 Looking for more ways to dress up your table? Get more table centerpiece ideas here! 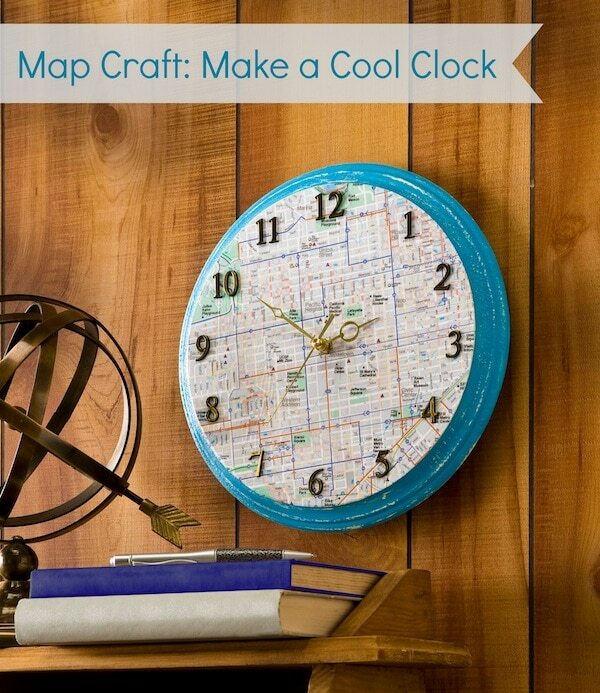 In a travel or worldly-themed space, a map-covered clock is the quintessential accessory. Secure and seal a map to a wooden round and then add numbers and a clock face. 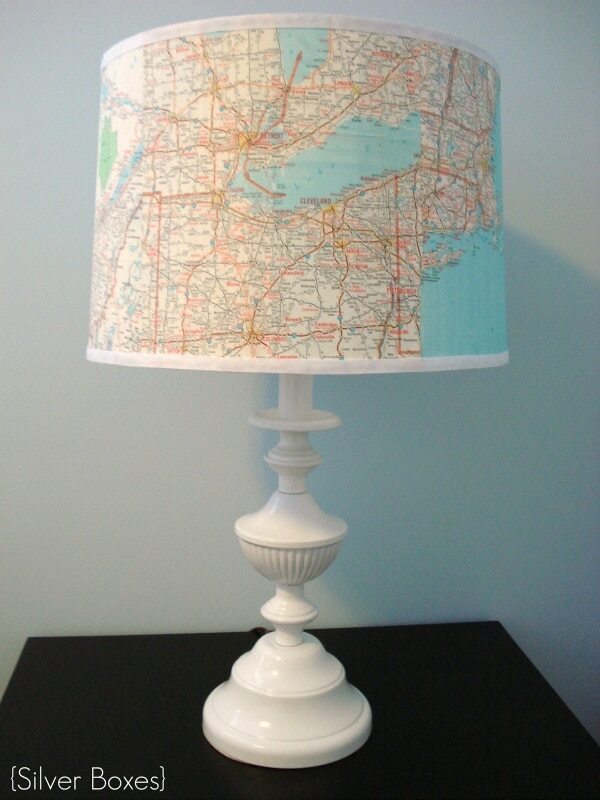 A map is a creative way to cover up an old or dingy lampshade. 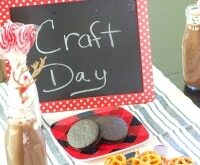 Use craft adhesive to attach the map to the shade, and then trim the edges with ribbon. 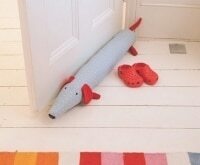 This project works best on cylindrical shades, so choose your shade wisely! Here’s a fun project to use up a variety of colorful (and partially damaged) maps. Cut out the prettiest spots of each map into leaf shapes. 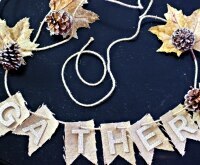 Secure them all to a wreath form to create a welcoming door display. 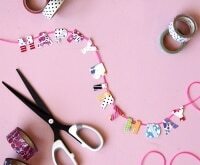 Show your state pride with this adorable jewelry project! All you need are Shrinky Dink sheets and print outs of your favorite countries or states. 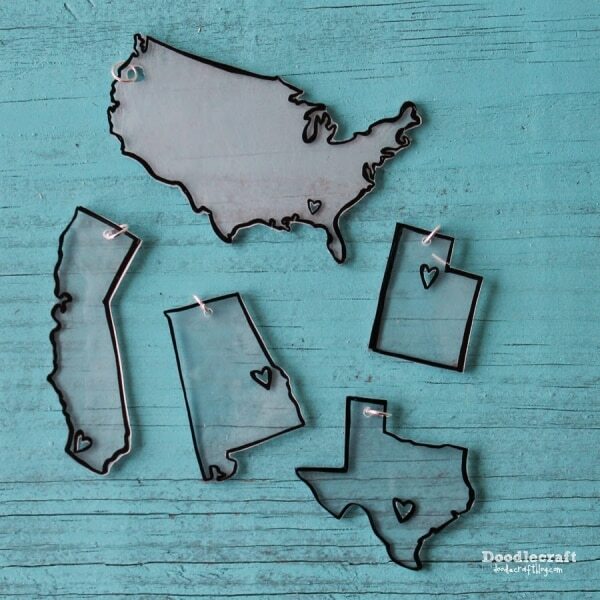 Make a whole set of your favorite places, and don’t forget to include a heart to show where you’re from. 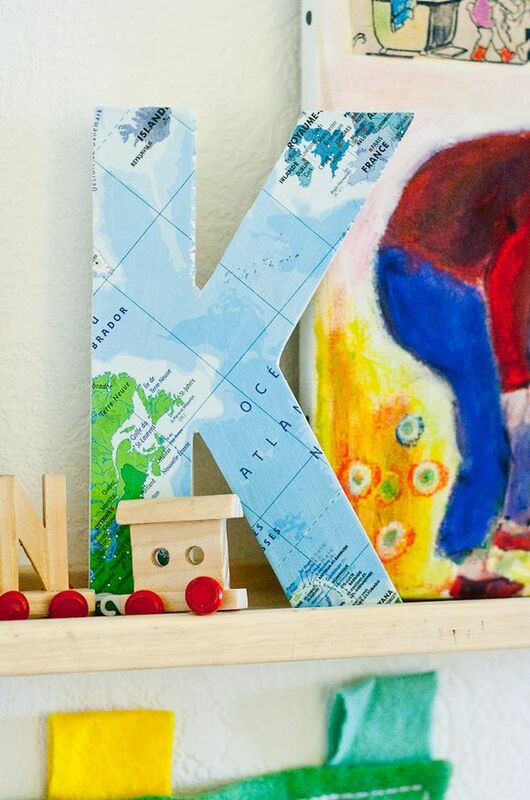 Here’s an awesome project for turning a plain globe into an awesome home accessory. 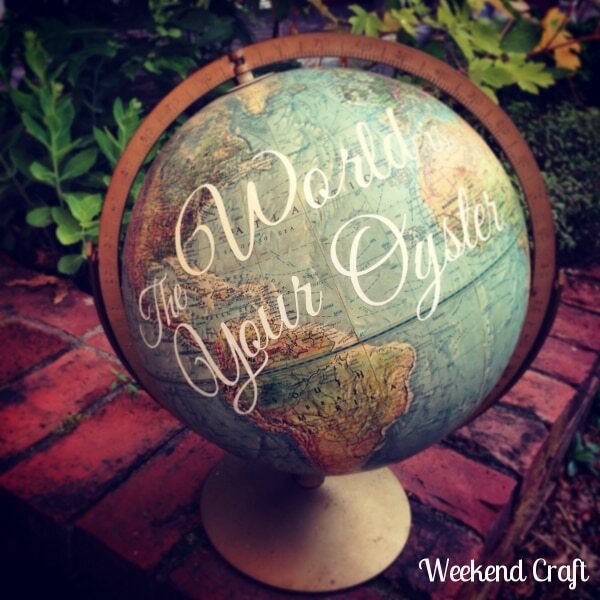 Cut out your favorite saying from vinyl and adhere it to a globe. 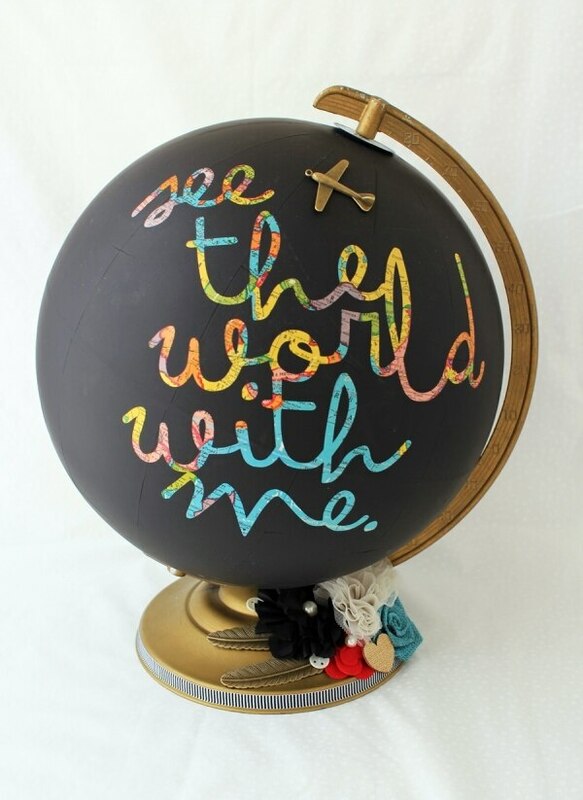 Spray the globe with chalkboard paint and then remove the vinyl letters to reveal the mapped words underneath. Be sure to lay your words over the prettiest parts of the globe to really maximize the effect. 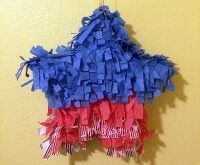 If you have the day off this Columbus Day, celebrate the discovery of this great nation by creating one of these fun projects. Keep your eyes out for maps or atlases at thrift and antique stores for unique and budget-friendly versions. 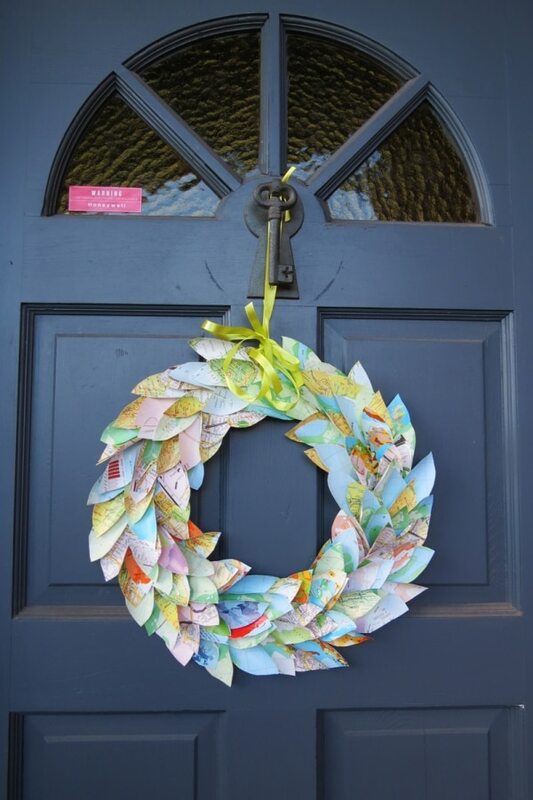 Whether you want to commemorate a favorite spot, show some local pride, or simply give new life to something old, maps are an ideal crafting medium for creating interesting and unique things for your home. Hey! Kelsie Ann from Cut, Craft, Create here. Thanks for including my photo map and for giving me credit. You rock! Sharing this on my page as well. Thank YOU for a wonderful project and sharing this post! :) We love your photo map!